Which technological path seems most promising to produce a quantum processor with a greater quantum volume (preferring fewer errors per qubit over more qubits), than Majorana fermions? "Group ABC's method DEF has demonstrated better QV than using MF; as proven independently in paper G on page x, paper H on page y, and paper I on page z". These particles could be the elementary brick of topological quantum computers, with very strong protection against errors. Our work is an initial step in this direction. In their paper "Robust quantum metrological schemes based on protection of quantum Fisher information", Xiao-Ming Lu, Sixia Yu, and C.H. Oh construct a family of $2t+1$ qubits metrological schemes being immune to $t$-qubit errors after the signal sensing. In comparison at least five qubits are required for correcting arbitrary 1-qubit errors in standard quantum error correction. [Note: This theory of robust metrological schemes preserves the quantum Fisher information instead of the quantum states themselves against noise. That results in a good effective volume if they can construct a device utilizing their techniques and show that it scales. After doing some research it looks like Graphene sandwiched between superconductors to produce Majorana fermions is the leading edge - is there something better? ["better" means currently possible, not theoretically possible or ridiculously expensive]. 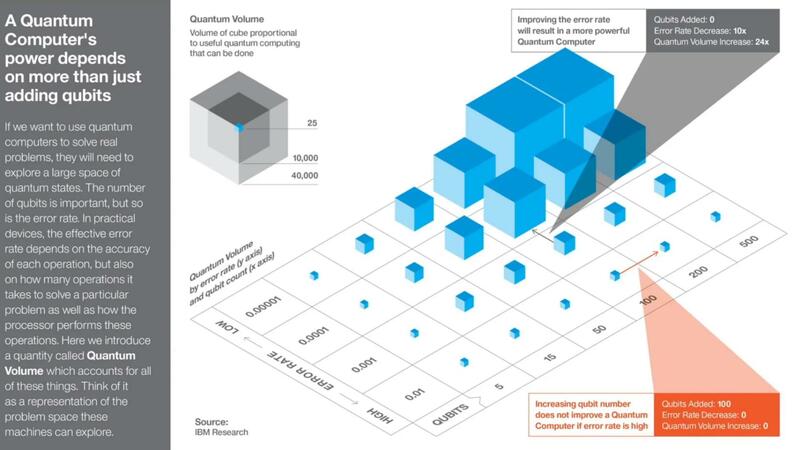 The graphic illustrates that over a hundred qubits with less 0.0001 error rate is wonderful, lesser answers are acceptable. That is indeed the most important question at the moment! Superconducting qubits currently have the biggest devices. But will they continue to scale? Will short coherence times make it too hard for error correction to keep up? Trapped ions are not far behind. But they have their own scalability issues. Spin qubits should be great for scaling once they get going. They are still down in the few qubits at the moment, though. Majoranas also are suspected to have some nice properties. But I’d have to see a single qubit before I declare them to be the leading edge. Photonics are also a viable strategy. In fact, the first cloud based quantum device was photonic. A few startups are also based around photonic based approaches, such as the one described here. What is the longest quantum circuit? Is the quantum Singleton bound compatible with the Toric Code?